Angela Merkel, the Chancellor of Germany held the phone talk with Vladimir Putin, the President of Germany on April 9. They discussed the deployment of the UN peacekeepers in Donbas as DW reported. Moreover, the fulfillment of the Minks Agreements and gas relations between Russian and Ukraine were discussed. According to the title, the leaders of the countries agreed on the necessity completely fulfill the Minks Agreements, particularly, to observe the Easter ceasefire and continuation of the prisoners’ exchange. 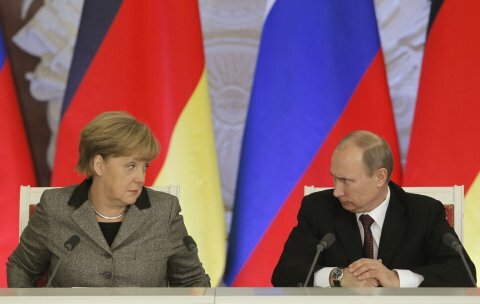 Also, Merkel and Putin agreed on the necessity to work in Normand Format. The press service of Kremlin also reported that Putin continues to insist on the deployment of the UN peacekeepers only as the security of the OSCE observers among the demarcation line. Also, Merkel will discuss this issue with Ukrainian President Petro Poroshenko who pays a visit to Germany on April 10.